Skillet Bacon Spread, from Skillet Street food, a Seattle-based restored Airstream mobile diner comes Skillet Bacon Spread...you say what? Yes, bacon you can spread...one taste & this will soon be your "go-to condiment!" 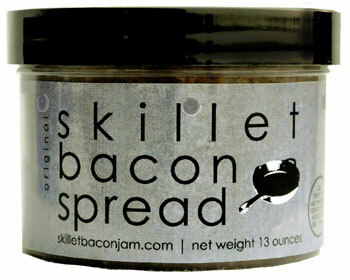 Skillet Bacon Spread...a delectable blend of smoky, tangy, savory & slightly sweet. Anyone who likes bacon will not be able to resist Skillet bacon spread. Skillet bacon spread is slow simmered for about 6 hours & made with uncured Niman Ranch bacon, onions, balsamic vinegar, brown sugar & spices. Unleash your senses...use Skillet Bacon Spread on hamburgers, steaks, grilled cheese sandwiches, as a base in a variety of soups, in egg dishes, on potatoes & more, use your imagination. Tasting is believing!!! Looks are deceiving but one sniff &...Skillet bacon spread tastes as good as it smells & has the consistency of chutney. Skillet Bacon Spread..."Pure bacon heaven." Size: Please note...our container is 11 oz. not 7 oz. From Seattle's Famous Skillet Airstream Trailer Kitchen.